It seems that ancient people had knowledge about the astronomical cycles of the Earth equal to our modern knowledge. Explore with us how the ancient astronomers could have discovered and precisely measured these cycles without any prior knowledge about them and without advanced technology we have today. What modern astronomy tells us about movements of our planet (and the moon). Learn how the discovery and precise description of basic astronomical cycles of our planet can be relatively easy (even in the ancient times). Although ancient astronomers could observe the sky only from a moving “point of view”, they managed to create calendars, predict seasons and eclipses, and precisely orient their monuments. Ancient monuments and writings from around the world are undeniable proof that thousands of years ago people had advanced astronomical knowledge. Explore few examples providing the evidence for it. The earth wobbles like a gyroscope in space (very slowly) spinning once per day while it “circles” the sun during its annual course. 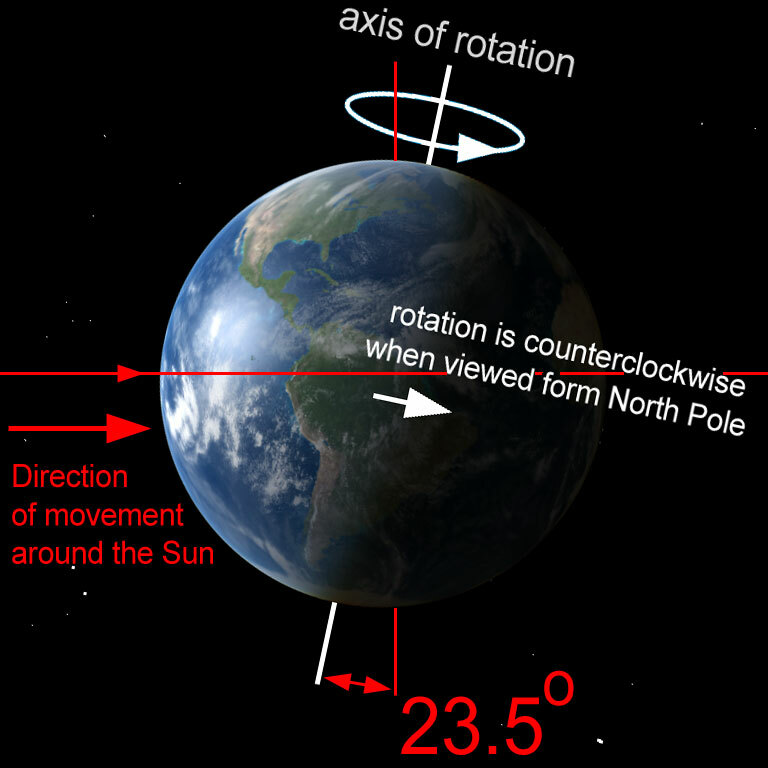 From a point high above the north pole of the solar system the planets are revolving about the sun and rotating about their axes in a counterclockwise direction. This holds true also for the asteroids. There are 2 exceptions: Venus, which spins clockwise (retrograde motion) and Uranus, which rotates 90 degrees away from its orbital motion). Venus rotates backwards compared to the other planets, likely due to an early asteroid hit which disturbed its original rotation. Venus travels around the sun once every 225 Earth days but it rotates clockwise once every 243 days. This peculiar combination gives it a day with respect to the sun of 117 Earth days. Uranus was also likely hit by a very large planetoid early in its history, causing it to rotate “on its side”. The satellites of the planets also generally revolve and rotate in a counterclockwise direction. Of the thirty something satellites only six do not do so; they are said to have retrograde motion. Of the six exceptions five are outer satellites likely to be captured asteroids. The Sun itself also rotates in a counterclockwise direction. The entire Sun doesn’t rotate at the same rate. Because the Sun is not solid, but is instead a giant ball of gas and plasma, different parts of the Sun spin at different rates. We can tell how quickly the surface of the Sun is rotating by observing the motion of structures, such as sunspots, on the Sun’s visible surface. The regions of the Sun near its equator rotate once every 25 days. 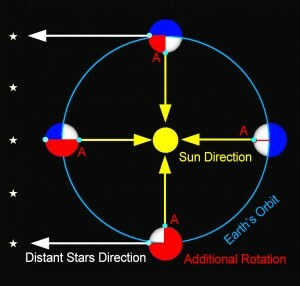 The Sun’s rotation rate decreases with increasing latitude, so that its rotation rate is slowest near its poles. At its poles the Sun rotates once every 36 days! The Moon spins once around its axis in counterclockwise direction at the rate 27 .3 days which is also the time for it to complete full orbit around the Earth. As the result the Moon always shows us the same side.Although the Moon makes a complete orbit around the Earth with respect to the fixed stars about once every 27.3 days (its sidereal period), since the Earth is moving along its orbit about the Sun at the same time, it takes 29.5 days for the Moon to show the same phase to Earth. The axial period is the time taken for an object to make one complete rotation on its axis. The axial period of a planet is its “day”. Earth spins around its axis in 1 day (24 hours = 1440 min = 86400 seconds). 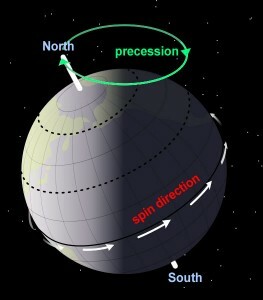 This axial rotation cycle is perceived as the cycle of day and night and it is responsible for the apparent (and constant) movement of the sun, the moon and stars. This axial cycle is useful for defining units of time and calendar. Note: The Earth makes 360 degrees rotation around its axis in relation to the distant stars in one “sidereal day”. However, in relation to the sun, due to the earth’s orbital movement, it rotates on its axis a bit more than 360° per (solar) day. This way in 1 year the Earth makes 1 extra rotation in relation to stars. 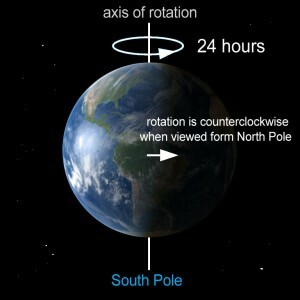 However, we define our 24 hour “day” relative to the Sun, not relative to the Earth’s actual rotation. If we didn’t do this, then “Noon” would occur a little later each day until “Noon” was happening at night! At present, Earth orbits the Sun once every 366.25 times it rotates about its own axis, which is equal to 365.25 solar days, or one sidereal year. 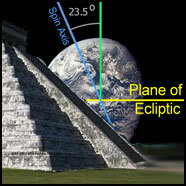 Note: Simple geometry shows that the angle between the zenith and the celestial equator (i.e. the zenith’s declination) must also be the angle between the north celestial pole and the north horizon. Since the zenith’s declination is equal to one’s latitude, one can determine his/her latitude by measuring the altitude of the celestial North Pole (currently well approximated by position of the star called Polaris). 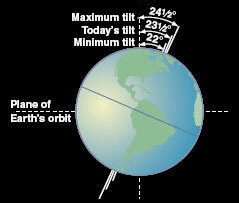 The tilt of the Earth changes slightly, with a dominant cycle every 41,000 years. The change in angle of inclination is only about 1° from the present tilt, from 23.5 to 24.5°. However, Earth’s tilt is a critical factor in climate resulting in very large differences in solar radiation. Changes in Earth’s angle with respect to the Sun often go by the name “obliquity”. 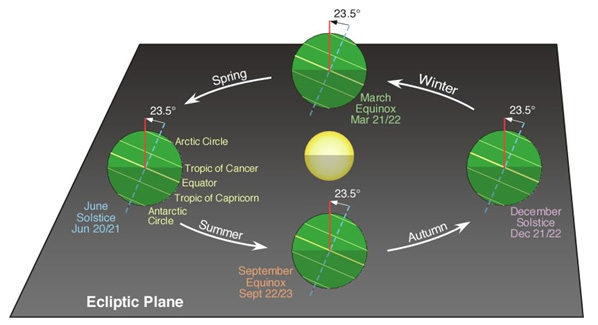 This orbital cycle combined with the tilt of the earth’s spin axis ( 23.44 degrees) is perceived as the cycle of seasons and it is also responsible for the variable length of the daytime (throughout the year); on the northern hemisphere summer daytime is much longer than in winter. 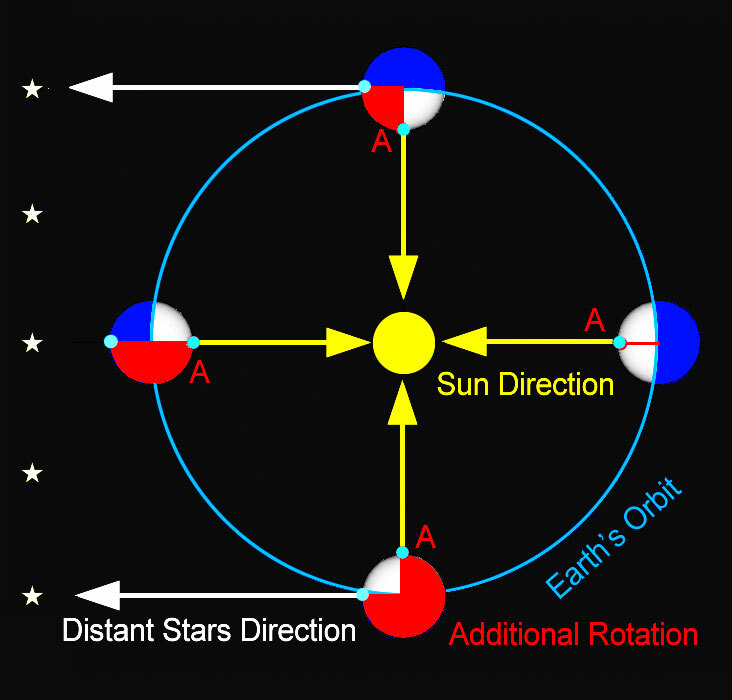 The earth makes one complete rotation around its axis (360 deg) in relation to distant stars (not the Sun) and the time to complete this full rotation is called sidereal day. In our daily lives it is practical to use “solar day” as a unit of time. Solar time is measured by the apparent diurnal motion of the sun, and local noon in solar time is the moment when the sun is at its highest point in the sky (exactly due south or north depending on the observer’s latitude and the season). The average time for the sun to return to its highest point is 24 hours. The stars are so far away that the Earth’s movement along its orbit makes nearly no difference to their apparent direction and so they return to their highest point in a sidereal day. Another way to see this difference is to notice that, relative to the stars, the Sun appears to move around the Earth once per year. Therefore, there is one less solar day per year than there are sidereal days. This makes one sidereal day approximately 365.24 / 366.24 times the length of the 24-hour solar day, giving approximately 23 hours, 56 minutes, 4.1 seconds (86,164.1 seconds). A mean sidereal day is about 23 h 56 m 4.1 s in length. A tropical year has 365.242190402 days. In astronomy, the ecliptic is apparent great-circle annual path of the sun in the celestial sphere (the projection of objects in space into their apparent positions in the sky as viewed from the Earth) , as seem from the earth. The plane of the path, called the plane of the ecliptic, intersects the celestial equator (the projection of the earth’s equator on the celestial sphere) at an angle of about 23.5º. 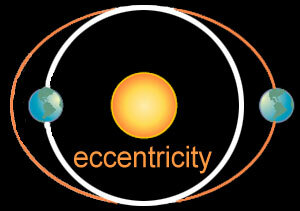 This angle is known as the obliquity of the ecliptic and is approximately constant over a period of millions of years. The two points at which the ecliptic intersects the celestial equator are called nodes, or equinoxes. 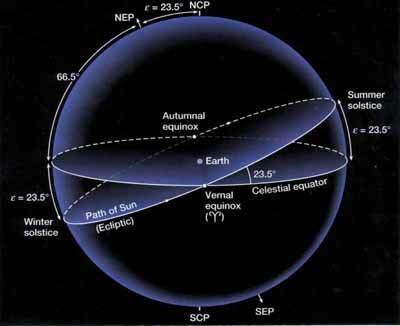 The sun is at the vernal equinox about March 21st and at the autumnal equinox about September 23rd. The equinoxes do not occur at the same points of the ecliptic every year, for the plane of the ecliptic and the plane of the equator revolve in opposite directions, respectively. The two planes make a complete revolution with respect to each other once every 25,920 years. This movement of the equinoxes along the ecliptic is called the precession of the equinoxes (also known as Platonic Year). 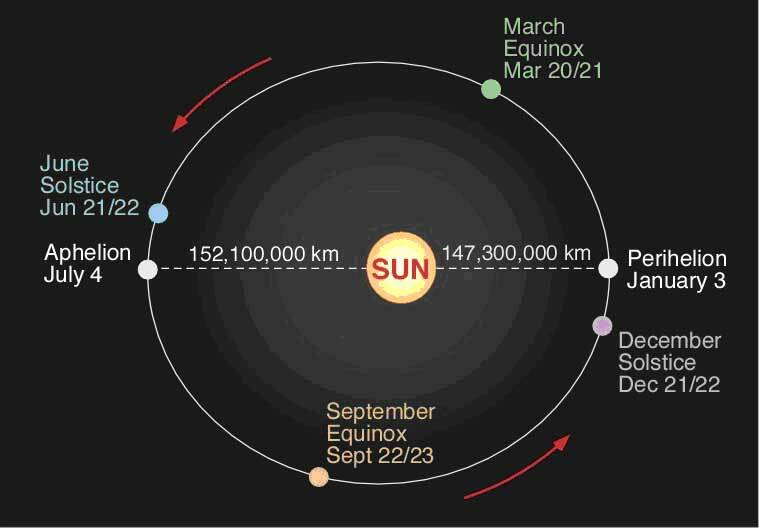 Precession causes movement of the position of the equinoxes and solstices relative to the Earth’s orbit around the Sun (and its aphelion, and perihelion). The earth wobbles like a gyroscope in space spinning once per day while it rotates around the sun during its annual course. The Earth is spinning on its axis in a counter-clockwise direction, and rotating around the sun also in a counter-clockwise direction, while the earth’s spinning axis wobbles like a gyroscope in a clockwise direction. 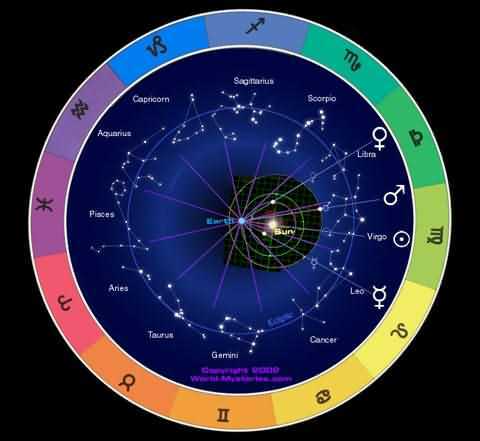 As the result, as the twelve constellations appear to move clockwise along/around the horizon during the course of its annual rotation around the sun during a year, the constellations, from spring or fall equinox to equinox, appear to move counterclockwise at the rate of 72 years/per degree, or one full wobble in 25,920 years of the earth’s axis. Although it is the Earth that moves on the orbit around the Sun, to the observer on the ground it appears that the Sun, the Moon, planets and stars are moving instead. Modern science tells us that Earth’s orbit has few more subtle cycles with very long periods. 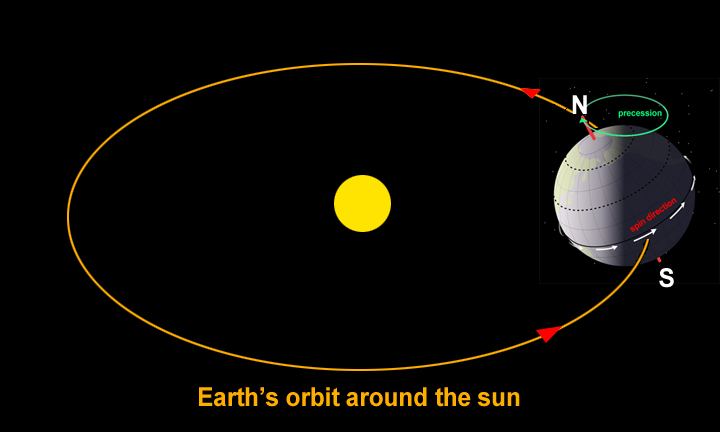 The shape of Earth’s orbit becomes more elliptical on time scales of about 100,000 years. At present the maximum difference between Sun-Earth distances during the years is only about 3% but over the past several hundred thousand years this number has been as small as 1%( a nearly circular orbit) and as large as 11%. Planets orbiting the Sun follow elliptical (oval) orbits (most orbits in the Solar System have very small eccentricity, making them nearly circular). 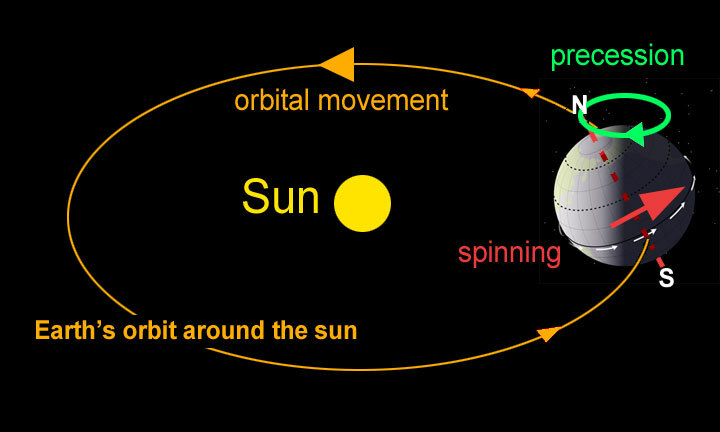 These orbits rotate gradually over time (apsidal precession). The orbital ellipse of the Earth precesses in space (primarily as a result of interactions with Jupiter and Saturn). 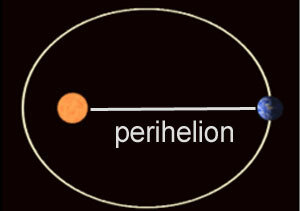 This orbital precession is in the same direction as the gyroscopic motion of the axis of rotation, shortening the period of the precession of the equinoxes with respect to the perihelion from 25,771.5 to ~21,636 years. 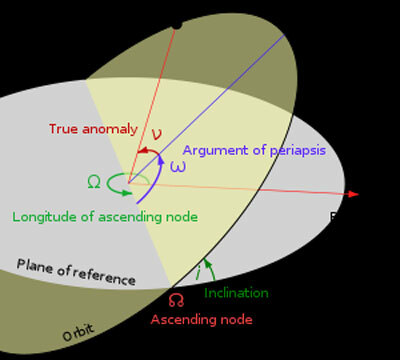 Apsidal precession occurs in the plane of the Ecliptic and alters the orientation of the Earth’s orbit relative to the Ecliptic. In combination with changes to the eccentricity it alters the length of the seasons. The inclination of Earth’s orbit drifts up and down relative to its present orbit. This movement is known as “precession of the ecliptic” or “planetary precession”. 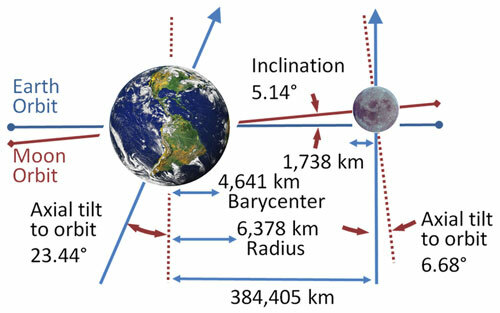 In the solar system, the inclination of the orbit of a planet is defined as the angle between the plane of the orbit of the planet and the ecliptic — which is the plane containing Earth’s orbital path. More recent researchers noted this drift and that the orbit also moves relative to the orbits of the other planets. The invariable plane, the plane that represents the angular momentum of the solar system, is approximately the orbital plane of Jupiter. The inclination of Earth’s orbit drifts up and down relative to its present orbit with a cycle having a period of about 70,000 years. The inclination of the Earth’s orbit has a 100,000 year cycle relative to the invariable plane. This is very similar to the 100,000 year eccentricity period. This 100,000-year cycle closely matches the 100,000-year pattern of ice ages. Milankovitch hypothesized that when some parts of the cyclic variations are combined and occur at the same time, they are responsible for major changes to the earth’s climate (even ice ages). He compared data about climatic fluctuations over the last 450,000 years (cold and warm periods) with mathematical theory of variations in eccentricity, axial tilt, and precession of the Earth’s orbit and found they were connected. The Earth’s axis completes one full cycle of precession approximately every 26,000 years. At the same time the elliptical orbit rotates more slowly. The combined effect of the two precessions leads to a 21,000-year period between the seasons and the orbit. In addition, the angle between Earth’s rotational axis and the normal to the plane of its orbit (obliquity) oscillates between 22.1 and 24.5 degrees on a 41,000-year cycle. It is currently 23.44 degrees and decreasing. These three orbital variations take place simultaneously. Like overlapping musical tones, these cycles create resonances that are not quite the same as the original cycles. The result is that the Earth’s climate is affected by these Milankovitch cycles on four different periods: 19,000, 23,000, 41,000 and 100,000 years. The term eclipse is most often used to describe either a solar eclipse, when the Moon’s shadow crosses the Earth’s surface, or a lunar eclipse, when the Moon moves into the Earth’s shadow. Eclipses may occur when the Earth and the Moon are aligned with the Sun, and the shadow of one body cast by the Sun falls on the other. 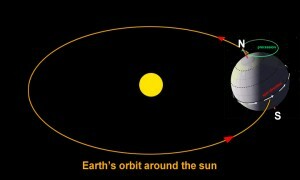 An eclipse does not happen at every new or full moon, because the plane of the orbit of the Moon around the Earth is tilted (5°09′ ) with respect to the plane of the orbit of the Earth around the Sun (the ecliptic): so as seen from the Earth, when the Moon is nearest to the Sun (new moon) or at largest distance (full moon), the three bodies usually are not exactly on the same line. When the Moon is in conjunction with the Sun (on the same plane) passing in front of the Sun, it casts its shadow on a narrow region on the surface of the Earth and cause a solar eclipse. At full moon, when the Moon is in opposition to the Sun (and on the same plane as Earth’s orbit around the sun) the Moon has to pass through the shadow of the Earth, and a lunar eclipse is visible from the night half of the Earth. Eclipses are separated by a certain interval of time. The orbital motions of Earth and Moon in relation to each other and the Sun generate repeating harmonic patterns. A particular instance is the saros, which results in a repetition of a solar or lunar eclipse every 6,585.3 days, or a little over 18 years. An eclipse involving the Sun, Earth and Moon can occur only when they are nearly in a straight line, allowing one to be hidden behind another, viewed from the third. An important aspect of eclipses viewed from the Earth is that apparent mean diameter of the Moon and the Sun is almost the same: 32′ 2″ for the Sun and 31’37″ for the Moon (as seen from the surface of the Earth right beneath the Moon) and: 1°23′ for the mean diameter of the shadow of the Earth at the mean lunar distance. Eclipses can occur only when the Moon is close to the intersection of these two planes (the nodes). The Sun, Earth and nodes are aligned twice a year (during an eclipse season), and eclipses can occur during a period of about two months around these times. There can be from four to seven eclipses in a calendar year, which repeat according to various eclipse cycles, such as a saros. Therefore, at most new moons the Earth passes too far north or south of the lunar shadow, and at most full moons the Moon misses the shadow of the Earth. 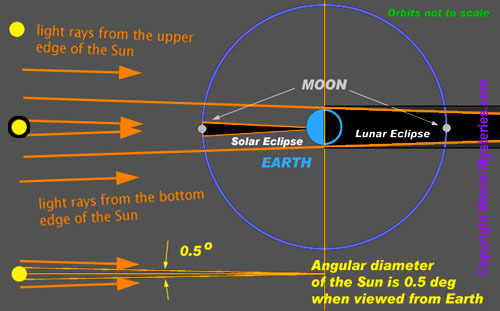 Also, at most solar eclipses the apparent angular diameter of the Moon is insufficient to fully obscure the solar disc, unless the Moon is close to perigee. In any case, the alignment must be close to perfect to cause an eclipse. 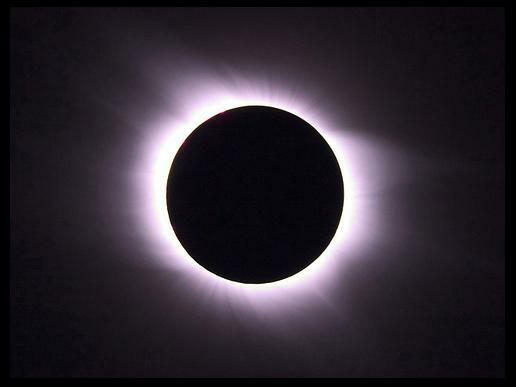 A solar eclipse occurs when the Moon passes in front of the Sun as seen from the Earth. The type of solar eclipse event depends on the distance of the Moon from the Earth during the event. A total solar eclipse occurs when the Earth intersects the umbra portion of the Moon’s shadow. When the umbra does not reach the surface of the Earth, the Sun is only partially occulted, resulting in an annular eclipse. Partial solar eclipses occur when the viewer is inside the penumbra. Solar eclipses are relatively brief events that can only be viewed in totality along a relatively narrow track. Under the most favorable circumstances, a total solar eclipse can last for 7 minutes, 31 seconds, and can be viewed along a track that is up to 250 km wide. However, the region where a partial eclipse can be observed is much larger. The Moon’s umbra will advance eastward at a rate of 1,700 km/h, until it no longer intersects the Earth’s surface. During a solar eclipse, the Moon can sometimes perfectly cover the Sun because its size is nearly the same as the Sun’s when viewed from the Earth. A total solar eclipse is in fact an occultation while an annular solar eclipse is a transit. Lunar eclipses occur when the Moon passes through the Earth’s shadow. Since this occurs only when the Moon is on the far side of the Earth from the Sun, lunar eclipses only occur when there is a full moon. Unlike a solar eclipse, an eclipse of the Moon can be observed from nearly an entire hemisphere. For this reason it is much more common to observe a lunar eclipse from a given location. A lunar eclipse also lasts longer, taking several hours to complete, with totality itself usually averaging anywhere from about 30 minutes to over an hour. There are three types of lunar eclipses: penumbral, when the Moon crosses only the Earth’s penumbra; partial, when the Moon crosses partially into the Earth’s umbra; and total, when the Moon crosses entirely into the Earth’s umbra. Total lunar eclipses pass through all three phases. Even during a total lunar eclipse, however, the Moon is not completely dark. Sunlight refracted through the Earth’s atmosphere enters the umbra and provides a faint illumination. Much as in a sunset, the atmosphere tends to more strongly scatter light with shorter wavelengths (blue and green), so the illumination of the Moon by refracted light has a red hue, thus the phrase ‘Blood Moon’ is often found in descriptions of such lunar events as far back as eclipses are recorded. 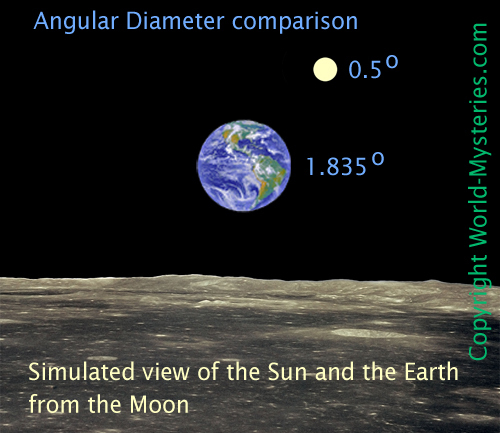 Our diagram is reflecting the fact that the angular diameter of the Sun viewed from the Moon is almost 4 times smaller than the angular diameter of the earth. The Moon has mass 81 times small than the Earth. It does not have a significant magnetic field, and it has no atmosphere. The new moon rises and sets at approximately the same time as the sun. The full moon rises at sunset and sets at sunrise. 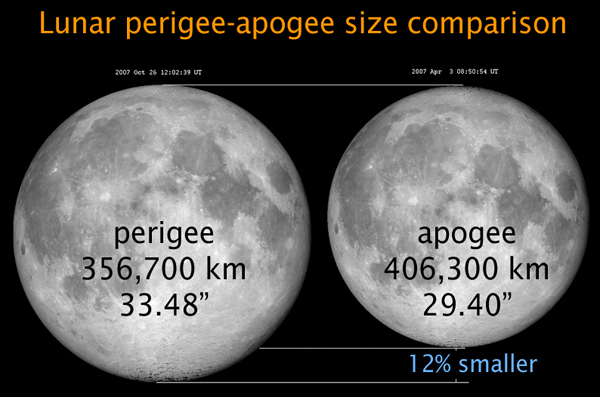 The moon moves toward the east in our sky by about 12 degrees each day. In representations of the Solar System, it is common to draw the trajectory of the Earth from the point of view of the Sun, and the trajectory of the Moon from the point of view of the Earth. This could give the impression that the Moon circles around the Earth in such a way that sometimes it goes backwards when viewed from the Sun’s perspective. 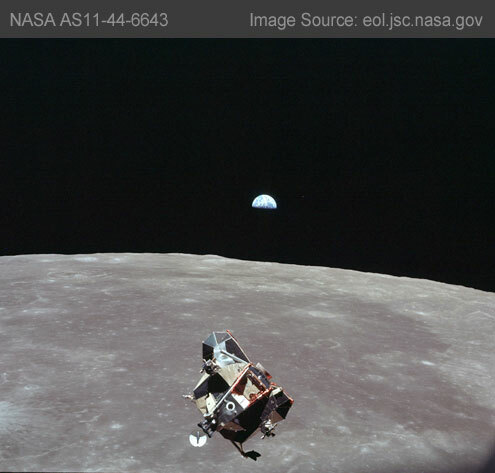 Since the orbital velocity of the Moon about the Earth (1 km/s) is small compared to the orbital velocity of the Earth about the Sun (30 km/s), this never occurs. 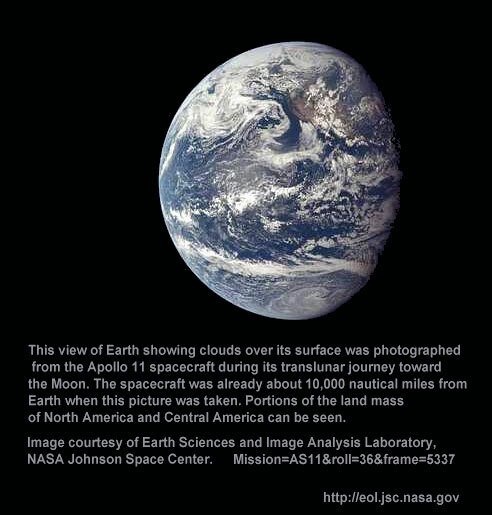 The Moon generally has one hemisphere facing the Earth, due to tidal locking. Therefore, humans’ first view of the far side of the Moon resulted from lunar exploration in the 1960s. 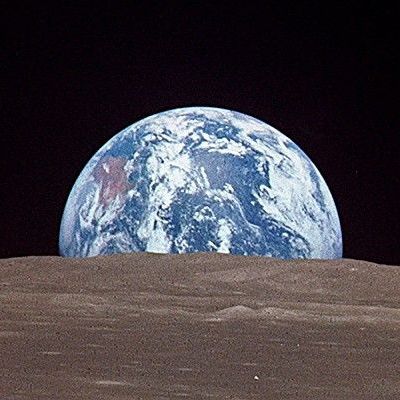 However, this simple picture is only approximately true: over time, slightly more than half (about 59%) of the Moon’s surface is seen from Earth due to libration. Libration is manifested as a slow rocking back and forth of the Moon as viewed from Earth, permitting an observer to see slightly different halves of the surface at different times. Lunar libration results from the eccentricity of the Moon’s orbit around Earth, a slight inclination between the Moon’s axis of rotation and the normal to the plane of its orbit around Earth and finally, from a small daily oscillation due to the Earth’s rotation, which carries an observer first to one side and then to the other side of the straight line joining Earth’s and the Moon’s centers, allowing the observer to look first around one side of the Moon and then around the other—because the observer is on the surface of the Earth, not at its center. Earth diameter = 12,742 km. 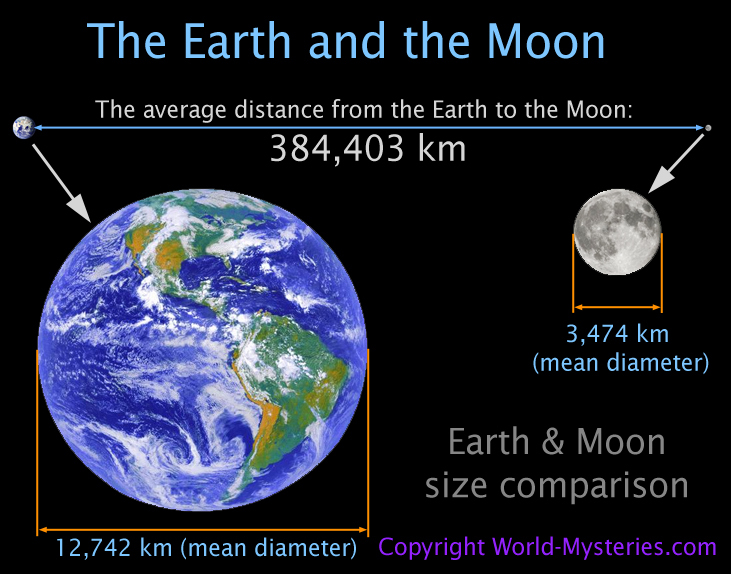 Earth-Moon distance: 378,028 km (average, moon surface to Earth center) so Earth angle from the moon = arctan ( 12,742 / 378,028) = 1.93 degrees. Earth-Sun distance = 149,598,261 km so Earth angle from the Sun is arctan (12,742 / 149,598,261) = 0.00488 degrees = 17.57 arc seconds. The prevailing hypothesis today is that the Earth–Moon system formed as a result of a giant impact: a Mars-sized body hit the nearly formed proto-Earth, blasting material into orbit around the proto-Earth, which accreted to form the Moon. A Hopi Connection with Other Ancient Sites?